For thousands of years, the people of Jikandia were happy and peaceful, utterly ignorant of the concept of time. Then...one day, uncountable hordes of dangerous creatures appeared, bringing chaos to Jikandia and setting the wheels of time turning once again. Plunged suddenly into this newly-temporal reality, the people of Jikandia fell into confusion, terror, and anarchy. In the midst of the mayhem gripping the land, an ancient spirit known as Temtem, hoping to restore peace and harmony to the troubled land, somehow gained mastery over time and space. With this new-found power, Temtem attempted to summon the nine heroes of legend. 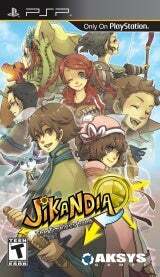 Nine kids on their way to school found themselves summoned through time and space to become the champions of Jikandia. However, only Al, who was separated from his friends while traveling through the void, appeared before Temtem. Neither of them knew what had happened to Al's friends, but it soon become clear that Al had to find them, and right Jikandia's wrongs, if he was ever to return home. 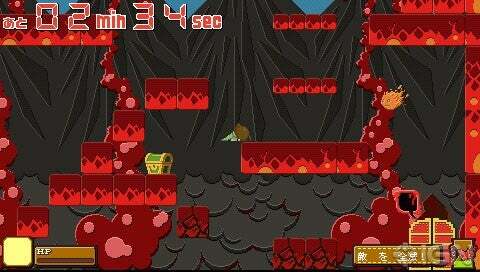 In Jikandia, you must travel through dungeons in search of your friends. You can set the time limit for each dungeon yourself! 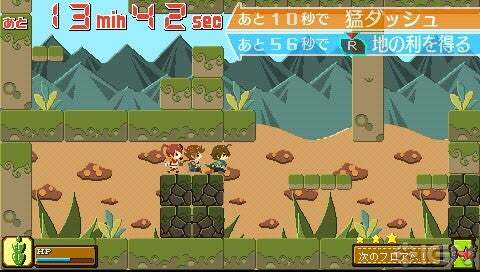 Dungeons are altered in several ways according to the time limit you set, so no adventure is the same twice! The longer you spend in one, the more likely you'll come across rare items and treasure chests...but you'll also face more monsters and difficult traps. Also, by meeting certain requirements, you can unlock specific events and cause legendary items to appear. Activating the Awakening mode will make you stronger, faster, and more powerful! Obtain magic orbs to customize your hero’s skills as you wish. Up to four PSP systems can be linked to play in the Jikandia Coliseum timed stages where you can battle against your friends and dodge traps to win with the highest score!